속리산 법주사로 가는 길 한가운데 서 있는 속리의 정이품송은 나이가 약 600살 정도로 추정되는 소나무로, 높이 14.5m, 가슴높이 둘레 4.77m이다. 이 소나무가 정이품송이라는 이름을 얻게 된 데에는 다음과 같은 이야기가 있다. 세조 10년(1464)에 왕이 법주사로 행차할 때 타고 있던 가마가 이 소나무 아래를 지나게 되었는데, 가지가 아래로 처져 있어 가마가 가지에 걸리게 되었다. 이에 세조가 “가마가 걸린다”고 말하니 소나무가 자신의 가지를 위로 들어 왕이 무사히 지나가도록 하였다 한다. 또 세조가 이곳을 지나다가 이 나무 아래에서 비를 피했다는 이야기도 있다. 이리하여 세조는 이 소나무의 충정을 기리기 위하여 정이품(현재의 장관급) 벼슬을 내렸고, 그래서 이 소나무를 정이품 소나무라 부르게 되었다. 이 소나무는 살아오는 동안 각종 재해를 입었는데, 특히 1980년대 초 솔잎혹파리의 피해 때문에 많은 비용을 들여 대규모 방충망을 설치하기도 했다. 이 소나무는 원래 삿갓 또는 우산을 편 모양으로 단정하고 아름다운 모습이었는데, 1993년 강풍으로 서쪽 큰 가지가 부러져 그 모습이 많이 상하였다. 속리의 정이품송은 나무의 모양이 매우 아름다우며, 크고 오래된 나무이어서 생물학 및 생물유전자원으로서의 가치가 매우 크고, 임금에게 섬기는 그 시대상을 잘 전해주는 전설을 가지고 있는 등 문화적인 가치 또한 크므로 천연기념물로 지정하여 보호하고 있다. 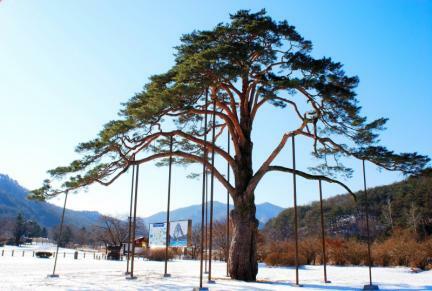 Jeongipumsong in Songnisan Mountain (Red Pine Minister Rank bestowed in Songnisan) is a 600-year-old pine tree with height of 14.5m and girth of 4.77m and can be found on the way to Beopjusa Temple. 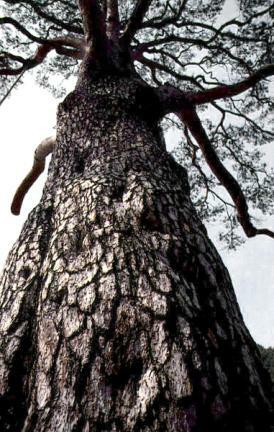 There are old stories regarding this tree. 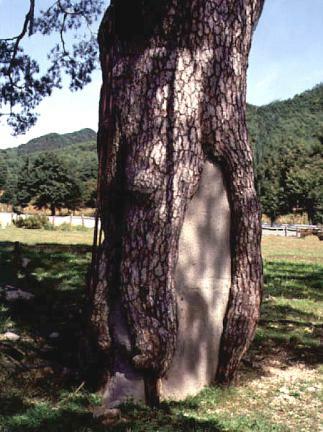 In the tenth year of King Sejo (1464), when the king visited Beopjusa Temple, he happened to run into the tree. At that time, the branches of the tree were hanging down, and the palanquin got stuck. 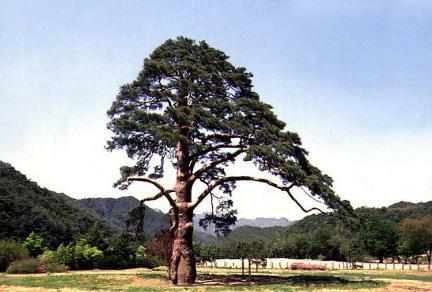 As soon as King Sejo said, "The palanquin got stuck," the pine tree raised its branches, and the king passed safely. 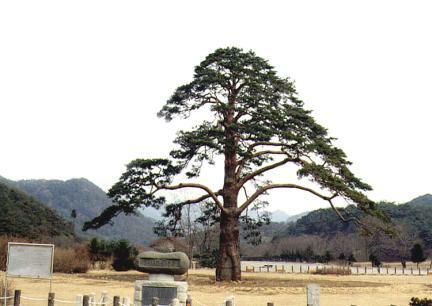 According to another story, King Sejo avoided rain under the tree. 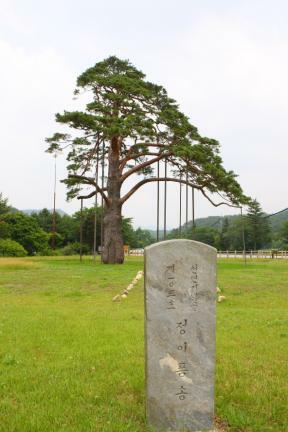 Because of these two incidents, King Sejo designated the pine tree as Jeongipumsong (post of minister) in honor of the tree's loyalty. 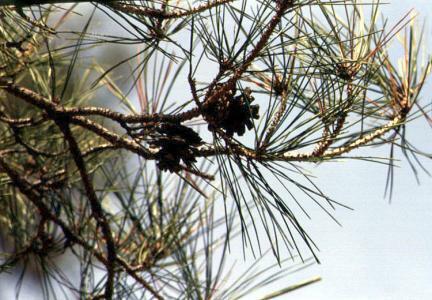 The pine tree has gone through a lot of damage. 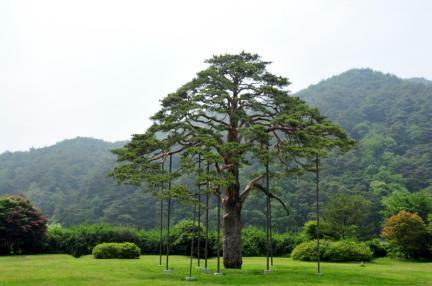 Subsequently, a large-scale screen was once installed to protect against Solliphokpari (Thecodiplosis japonensis) attack. 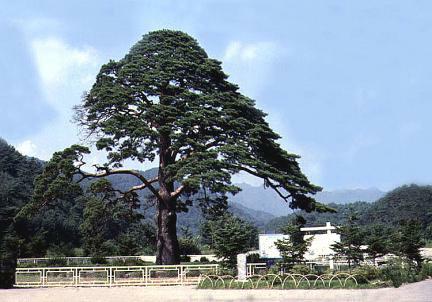 The pine tree used to be beautiful, shaped like a conical hat or an umbrella, but its branches on the west side were broken off by a strong wind in 1993. 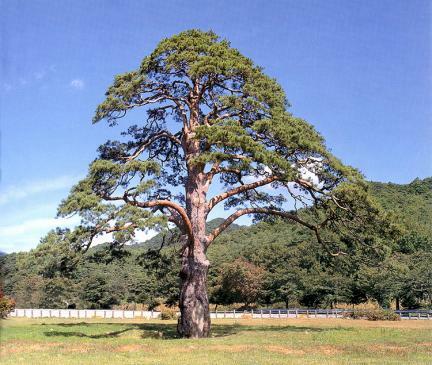 Songni Jeongipumsong Pine Tree, Boeun is considered a faithful tree, and it has been preserved by descendants. 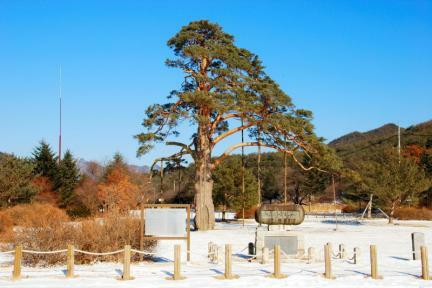 Since it is biologically and historically valuable, Jeongipumsong is preserved and protected as a natural monument.